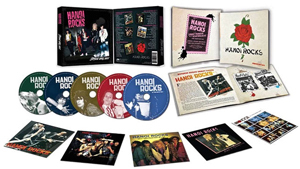 HANOI ROCKS are about to have their early albums compiled into two collector’s edition box sets by Cleopatra Records on October 21st. One is a 5CD set and the other a 6LP vinyl set. Entitled Strange Boys, these collections offer the band’s first four studio albums, plus the live album All Those Wasted Years! These are the complete albums and include several of the group's signature tunes, such as "Tragedy”, "Motorvatin’”, ”Don't You Never Leave Me”, “Malibu Beach Nightmare”, "Back To Mystery City" and a ton more. These gorgeous sets re-create all of the band’s original artwork and come with a glossy full-color booklet, which contain rare photos and extensive excerpts from the band's official biography, All Those Wasted Years, which will be released for the first time in English this year. HANOI ROCKS was formed in Helinski, Finland in 1979 by Michael Monroe (Matti Fagerholm) and his friend, guitarist Andy McCoy (Antti Hulkko). The band saw major success in the early ‘80s, having sold over 1,000,000 albums while touring the world. However, heartbreak struck the band when drummer Nicholas “Razzle” Dingley was killed in a drunk-driving accident after a day of partying with fellow glam rockers MOTLEY CRUE. HANOI ROCKS broke up a year later in 1985, only to resurrect themselves in the early ‘90s with a reunion tour and several more studio albums. Now, decades later, Cleopatra Records keeps the legacy of Hanoi Rocks alive with this superb reissue that fans will absolutely love! You can purchase the CD box set HERE, or the LP box set HERE.